Violinist Kate Suthers leads the award-winning Artesian Quartet and enjoys a varied performance career around the UK. 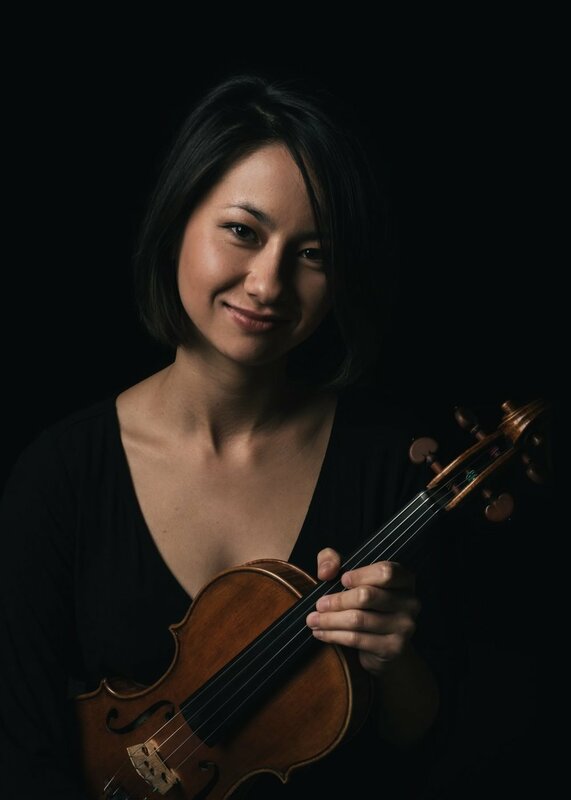 In May 2016 she was appointed Section Leader of Second Violins at the City of Birmingham Symphony Orchestra. Kate studied at the Royal Academy of Music with Gyorgy Pauk before completing a further year as a CAVATINA Chamber Fellow as part of the Artesians. Alongside chamber music and the CBSO, Kate performs in principal roles with groups around the country, from the Royal Philharmonic Orchestra in London to touring candlelit venues with the Scottish Ensemble. As part of her orchestral training Kate performed with both the Philharmonia and London Symphony Orchestras, toured with the European Union Youth Orchestra, recorded with Trevor Pinnock for Linn Records and received leadership mentoring from Clio Gould, Andrew Haveron and Zsolt Tihamėr-Visontay. Born and raised in Sydney, Kate feels she is still adjusting to the weather in the UK despite living there for almost half her life. She is a keen baker and cook, a coffee fanatic, fledgling runner and, when time allows, an avid reader and traveller. Kate plays on a Marchetti violin, kindly on loan from the Harrison Frank Foundation. Cassi began playing the violin at the age of four learning locally in her home town of Buxton with Patricia Curteis. At the age of thirteen she became a member of the National Youth Orchestra of Great Britain and later went on to join the European Union Youth Orchestra. Having studied at the Purcell school and then the Royal Academy of Music under the tutelage of Richard Deakin and Maurice Hasson, Cassi has performed in masterclasses with artists such as Maxim Vengerov and the late Thomas Brandis. She was a founding member of the Bernadel Quartet with whom she had the opportunity to perform at venues such as the Wigmore Hall, St James’ Piccadilly and St Martin-in-the-Fields. With the Bernadels she attended West Cork Chamber Music Festival and IMS Prussia Cove studying with Cuarteto Casals and Thomas Adès. They also completed a coaching scheme with the Belcea Quartet and CAVATINA Fellowship at the RAM. Cassi enjoys chamber music in all forms and has performed with Wales based Nidum Ensemble and the Aurora Orchestra. She also freelances with the City of Birmingham Symphony Orchestra, Philharmonia Orchestra and the London Symphony Orchestra. Away from the violin Cassi loves to get back up North for some fresh air and to visit her horse, Donald. Cassi’s violin is a 2009 Glen Collins. Violist Matt Maguire enjoys a varied freelance career in the UK. Matt splits the majority of his time between his hometown of Manchester, and London. He is Sub-Principal viola of the City of London Sinfonia and also enjoys working with other chamber orchestras such as Academy of St Martin in the Fields and Manchester Camerata. A former member of the European Union Youth Orchestra, Matt also enjoys playing symphonic repertoire and works with orchestras such as Royal Philharmonic Orchestra, BBC Philharmonic and Bournemouth Symphony Orchestra. Alongside being a founding member of the Artesians, Matt is a founder member of United Strings of Europe and is in demand as principal for new emerging ensembles. Having previously played guitar in a funk band Matt is passionate about many genres of music from blues to heavy rock and is principal viola of the acclaimed jazz group Engines Orchestra. He also plays with groups such as Heritage Orchestra and London Contemporary Orchestra which has led to him playing with a whole range of artists from Michael Bublé to Richard Ashcroft. Matt studied with Martin Outram at Royal Academy of Music where he gained 1st class undergraduate and masters degrees and was awarded Countess of Munster Musical Trust and Leverhulme awards. Alongside music Matt is a big football fan and has been a season ticket holder at Manchester City since the age of 7, and regular plays himself. Matt plays on a 2006 Helen Michetschläger instrument. António is berlin-based and is focusing his career between Germany and the UK in chamber and orchestral music. As an orchestral player, António mostly enjoys a career in opera and ballet music, recently becoming Sub-Principal of the Royal Ballet Sinfonia, Birmingham Royal Ballet. He has also been on demand for principal and section positons with many orchestras across the UK, including Orchestra of the Opera North and BBC Scottish Symphony Orchestra. António’s orchestral journey included being co-principal of the European Union Youth Orchestra in 2010, where he had the chance to perform with renowned conductors in the great concert halls all over Europe, Asia and America. He was also awarded The Sir Robert Bellinger Award during his time in the orchestra. In Berlin, António plays mostly as a session player and explores different combinations of chamber music, performing in churches and music clubs across town. António studied at the Royal Academy of Music with Professor David Strange. Throughout his studies, he was a keen chamber musician and was awarded the Leverhulme Mentorship for good achievement in orchestral playing. He led the cello section several times in the academy orchestras and explored many different combinations of chamber ensembles. His studies were kindly supported by scholarships from GDA and Fundação Calouste Gulbenkian in Portugal. As a passionate chamber musician, António joined the Artesian Quartet in 2012. They have been awarded the Wolfe Wolfinsohn String Quartet Prize and the St. Peter’s award, giving them a one-year residency in St. Peter’s Eaton Square. The Artesian Quartet became Park Lane Group Artists in 2014, went in residency in Aldeburgh and were awarded a Mentorship Scheme by Chamber Studio in Kings Place and a Fellowship at the Royal Academy of Music. António plays a cello by Bernard Camurat, 1996.